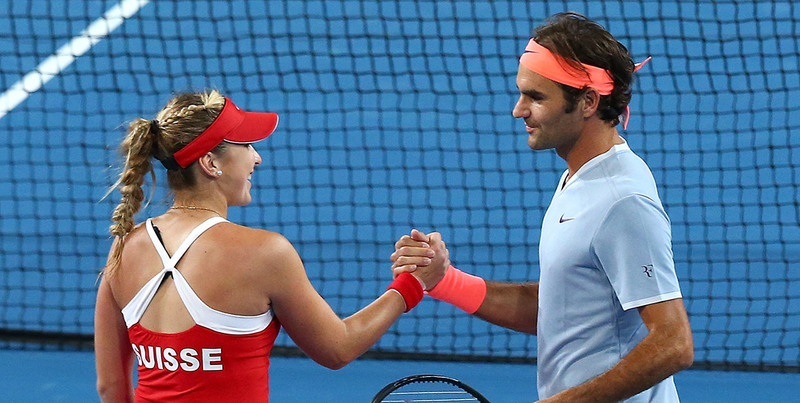 We constantly hear about how men’s and women’s tennis are two totally different games. But how much do they truly contrast with one another? In the second part of our series analysing the similarities and differences between men’s and women’s tennis, we find out from the stars themselves just what it’s like to face a professional player of the opposite gender. Once upon a time, Goran Ivanisevic didn’t really rate female tennis players. That was until he played the Hopman Cup in 1996. The difference in playing level between men’s and women’s tennis is often portrayed and accepted as a wide, gaping chasm. Therefore, Ivanisevic’s revelation was a surprise. In the late 1990s, Boris Becker was reported as saying then-world No.1 Hingis wouldn’t crack the top 100 if she played on the ATP Tour. Jeff Tarango went further in 2013, believing reigning No.1 Serena Williams unable to beat a man ranked inside the top 300. Yet here was Ivansevic – one of the greatest servers of all time who frequently belted hundreds, if not thousands, of aces past men each season – saying that two women had handled his serve more adeptly. What we have come to glean in the 20 years since Ivanesevic’s comments is that professional female players return at an extremely high level. Several of them, including Serena and Venus Williams and Sabine Lisicki, have produced serving speeds higher than many men. Women can also power their shots off the ground at comparable speeds with the men – Madison Keys has in recent years consistently clocked faster groundstrokes than the majority of the men’s tour. Perhaps the gulf is not so wide after all. > Part I: are the men’s and women’s games as different as believed? As hypothetical as this subject is, it always generates interest. Type “could a female tennis player beat a man?” into Google and a plethora of forums emerge discussing the topic as well as several news articles exploring it. Chat to the right people and you gain some valuable insights. Which is exactly what happened when Jon Wertheim broached the subject with James Blake in a recent edition of the Sports Illustrated/Tennis Channel Beyond the Baseline podcast. Wondered Wertheim: if he couldn’t see that it was Serena at the other end of the court, what would Blake make of the shots coming at him? Blake is well qualified to comment. The former world No.4 teamed with Williams to win the Hopman Cup for the United States in 2003 and a few years later practised with her when the pair were in Los Angeles at the same time for the ESPYs. This was an unusual occurrence – Blake said the men and women didn’t often practice together. Yet he liked what he saw from his compatriot. “Obviously just physically, men are a little stronger and a little faster sometimes. But she was just not listening to that – she wanted to do every single drill I did, she wanted to compete every single way possible with me,” he said. While it may not be common for top men to practice with women, men at the lower tiers frequently do, often acting as hitting partners. Sam Stosur said while it was often more “relevant” to practice with other women, she benefitted enormously from hitting with men. “You can play any (guy) really and just know that their serve’s going to be harder and faster than most girls that you play. It’s actually sometimes good to play the guys in points too because of the way they move – they’re so fast,” she explained. Reading between the lines? Stosur can still hit winners against men. The Australian revealed that she hit several times with men’s pro James Duckworth – albeit when the 25-year-old former No.82 was a emerging junior in Sydney. She has also practised with New South Wales-based juniors Kody Pearson and Benard Nkomba, who are beginning to transition to the professional ranks. Another player benefitting from similar practice is Maria Sharapova. The five-time major champion prepared for Australian Open 2013 by taking on Australia’s best male juniors in a series of practice sets. When Sharapova mentioned this in a press conference, a journalist was intrigued. How did she handle them? The player she wouldn’t name? That was Thanasi Kokkinakis, then 16 years old who around the same time stretched Steve Johnson to 17-15 in the third set in Australian Open qualifying. Luke Saville contested the main draw, going four sets with world No.73 Go Soeda in round one. Male juniors are by no means easy pickings on the match court. In the months since his Wimbledon boys’ singles title last year, 17-year-old Denis Shapovalov beat Nick Kyrgios at the Toronto Masters and has represented Canada in Davis Cup. His victim in that Wimbledon boys’ final, Alex De Minaur, this year qualified for the ATP event in Brisbane and won main-draw matches in Sydney and at the Australian Open, also aged 17. Both are still eligible to play juniors for another year. More than two decades after Ivanisevic’s experience, the great Roger Federer had a similar discovery at the Hopman Cup. Representing Switzerland alongside Belinda Bencic in 2017, Federer – one of the game’s best servers – hit the practice court with the teenager. Bencic has been coached by Hingis’ mother Melanie Molitor, who also oversaw the development of the return that served Hingis so well against Ivanisevic. “I couldn’t believe how good Bencic was on the return. She would crush all my second serves. I told her where I was going to go. That was something I can do,” Federer said. Stay tuned for the final part of our analysis, where we go behind the scenes to hear from officials and trainers about their views on the differences between men’s and women’s tennis.